Tusker Trails is a private resort owned and managed by Maharajakumari Vishalakshi Devi(daughter of Jayachamarajendra Wodeyar) and her husband Kanwar Gajendra Singh. It is a resort with 12 cottages tastefully done with a swimming pool, indoor games and their own jeeps to take you to the safari. 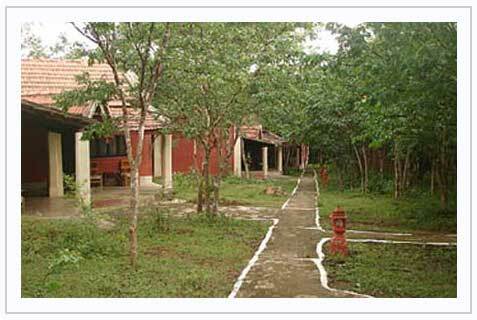 Bandipur is interconnected with nagarhole national park, mudumalai and waynad in kerala. Activities: Morning and evening open jeep safari, trekking with help of guides at cost, conference arrangements, campfire, wildlife filmshow and barbecue on request. Food: Serves both indian and continental for breakfast. Lunch and dinner will be predominently indian with veg and nonveg spread. Tariff is per couple per night inclusive of accommodation, one session of lunch, dinner, breakfast, morning/ evening coffee/ tea. Single occupancy charges would be same as that of double occupancy. Children between 5 to 12 years will be charged. Children above the age of 12 years considered as adult. Cancellation or refund is as per hotel guidelines. Bangalore - Mysore - Gundlupet - Bandipur. Total distance 220 kms ( 5 hours). You can also reach from Coimbatore - Ooty - Gudalur - Bandipur 3rd route would be Calicut - Waynad - Sultan bathery - Gundlupet- Bandipur. At Gundlupet, take deviation towards ooty. Those who wish to reach by bus, can go by private/ government buses to bandipur and get down at forest department reception office. Resort would send their jeeps and pick you up complimentary provided informed well in advance.